The Toronto race isn’t everyone’s favorite on the circuit but the Rogers Centre in downtown Toronto is a great venue, the hotel is right inside the dome and the dirt problems of the past are gone. 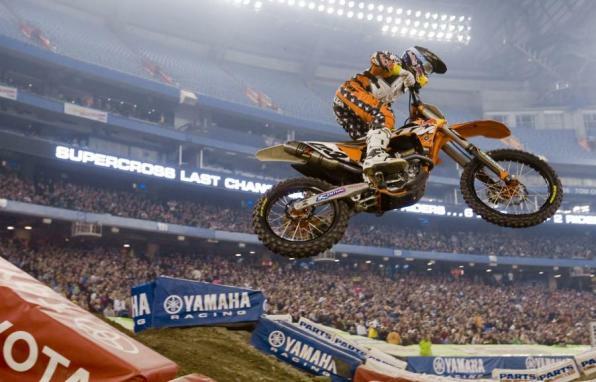 On top of all that, the racing usually turns out pretty good and the crowd has grown each and every year, as the Canadians seem to be embracing supercross. Lots of questions about where the Canadian riders were. It’s a long story as to why the locals don’t race but there was one who did sign up. Redemption Racing’s Josh Snider entered the 450 class on his Kawasaki but unfortunately for Josh, a lack of riding time as well as some bike problems kept him from making the night show. If Canadian fans were desperate to attach themselves to someone out, there were a couple of riders with Canadian “roots”. Former Canadian MXDN member Dean Wilson was in the house and sure, Dean now has chosen to ride under his native flag of Scotland but he did begin his pro career in Canada as well as live there for almost a decade. If the whole MXDN thing upsets you and you needed someone else, well, there was New Yorker Bobby Kiniry racing. Kiniry has raced in Canada the last couple of years and is one of the friendlier riders on the circuit in any country. Kiniry had a busy weekend as after the Toronto SX (where he did not make the main event due to some crashes) he was driving a couple of hours to go try his hand at Sno-Cross. His Canadian team also runs a sno-cross team and Bobby was going to give it a shot. The track did have some rocks on it and many a rider was forced to put on underprotectors to, well, protect themselves from the projectiles. There were also handguards mounted and KTM rider Andrew Short even donned a full over the jersey protector! Shorty running the full chest pro. There wasn’t too much different out there being done by the guys but along the end of the track a few riders (Stewart, Tedesco and Brayton) were quading out instead of the jump on/jump off. Tedesco told me that that line would not be the race line as when you landed, it took you too wide outside. And he turned out to be right. Malcolm Stewart certainly has the speed to finish in the top five consistently, maybe even a podium guy but he can’t seem to stay off the ground. Early on in the series, Stewart was crashing quite a bit but he smoothed it out for a few races to do pretty well. The last two weeks have been rough on Mookie as he crashed out of both races. Ryan Sipes is killing it in practices, he’s been the fastest guy more than a couple of times and although he has a win this year, there have to be times where he’s wondered “What if?”. In Toronto he and his team were upset over a move by Blake Wharton that they thought was pretty aggressive. After the race was over, Sipes rode over to the podium and had some words with Wharton. One of the Honda guys pointed out to me that what Sipes did to Wharton at the opening round at Houston (where he made a pretty aggressive move late in the race costing both riders a shot at the box) deserved payback at some point and in Toronto, “I guess it was time,” said the source..
J-Star JDR KTM’s PJ Larsen had his best finish of the season as he ended up fourth on the night in a pretty lonely ride. After being forced to head down under to Australia in order to get a job last year, I’m sure Larsen will take it! He’s now sixth in the points and just nine back of Wharton for a top five position. Gannon Audette had his best finish of the year as well and the rookie is figuring things out there on his DNA Shred Stix Star Racing Yamaha. Gannon Audette (533) had a solid night with a career-best finish, but his teammate Ryan Sipes (25) didn't have such an easy time. James Stewart doesn’t like to practice all that much during the day, he once told me that he knows within five minutes of the first practice what everyone’s going to jump and what he’s going to need to do to win. He usually cruises in the third and final practice, but in Toronto he laid down one very fast lap to get the pole position. In the last practice Stewart put in two out of nine laps that were race pace which is about usual for him. Honda’s Cole Seely has one more race in the factory truck and then it’s back to the Lucas Oil TLD Honda team to get ready for the rest of the west lites series. So far in three races, Seeley has gone 9-15-10 on Josh Grant’s CRF450. Team San Manuel Yamaha’s Kyle Regal was in Toronto to hang out and do some sponsor obligations. Despite breaking his wrist just a month ago, Regal hopes to start riding this coming week with an eye toward returning to racing in Dallas. Another rider hoping to be back in Dallas was Motoconcepts Yamaha’s Tommy Hahn. Hahn’s teammate Kyle Chisholm looks to be coming back for the outdoors as he is still recovering from his bad crash at Houston. Nick Wey continues to get better and in Toronto, Wey ran up front for a long time before settling for sixth. Wey tested some new fork settings that seems to be agreeing with him as he starts to defend his 2010 Canadian Supercross championship. Wey’s teammate Austin Stroupe went down about halfway into the main event and looked to have the wind knocked out of him. It was bad enough that Stroupe was forced to DNF the main. Also DNF’ing was Mike Alessi. When I caught up to the Mike and his father Tony as they were leaving the track, Tony told me that the “motor broke” and they were freezing and had to go. Alessi’s teammate Andrew Short had some sort of fuel related problem in the heat race and was unable to finish. He was forced to go to the LCQ to make the main and he had a battle in there with Jason Thomas and Fabien Izoird. Ryan Dungey has nine podiums in twelve races for the most times on the box in the 450 class. 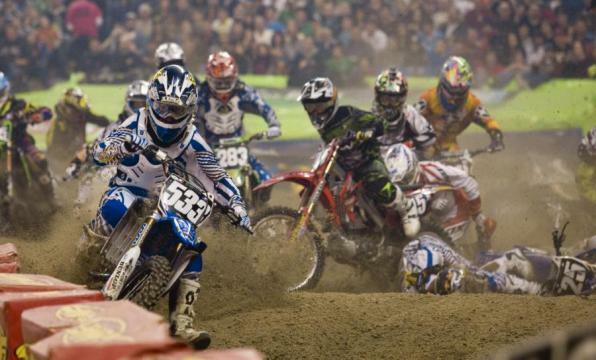 Chad Reed and Ryan Villopoto are tied with eight each while James Stewart has seven.